From his corner office on the forty-fourth floor of the Bank of the Americas tower on Wall Street, Tom Smith, global managing director for security, could see the Statue of Liberty, Battery Park—and a ravening zombie horde. Officially, Smith was paid to preserve the lives and fortunes of employees, billionaires, and other clients. And with an implacable virus that turned the infected into ravenous zombies tearing through the city, the country, and the world, his job just got a lot harder. Good thing Smith, late of the Australian special forces, isn’t a man to give up easily. But saving civilization is going to take more than the traditional banking toolbox of lawyers, guns, and money. Smith needs infected human spinal tissue to formulate a vaccine—and he needs it by the truckload. To get it, he will have to forge a shady alliance with both the politicians of the City of New York and some of its less savory entrepreneurs. But all of his back-alley dealing may amount to nothing if he can’t stave off the fast-moving disease as it sweeps across the planet, leaving billions dead in its wake. And if he fails, his only fallback is an incomplete plan to move enough personnel to safe havens and prepare to restart civilization. What’s more, there are others who have similar plans—and believe it or not, they’re even less charitable than a Wall Street investment banker. Sooner or later Smith will have to deal with them. But first he has to survive the Fall. A New Novel in John Ringo’s best-selling Black Tide Rising zombie apocalypse series. John Ringo brings fighting to life. He is the creator of the Posleen Wars series, which has become a New York Times best-selling series with over one million copies in print. The series contains A Hymn Before Battle, Gust Front, When the Devil Dances, Hell’s Faire, andEye of the Storm. In addition, Ringo has penned the Council War series. Adding another dimension to his skills, Ringo created nationally best-selling techno-thriller novels about Mike Harmon (Ghost, Kildar, Choosers of the Slain, Unto the Breach, A Deeper Blue, and, with Ryan Sear, Tiger by the Tail). His techno-thriller The Last Centurion was also a national bestseller. A more playful twist on the future is found in novels of the Looking-Glass series: Into the Looking Glass, Vorpal Blade, Manxome Foe, and Claws That Catch, the last three in collaboration with Travis S. Taylor. His audience was further enhanced with four collaborations with fellow New York Times best-selling author David Weber: March Upcountry, March to the Sea, March to the Stars and We Few. 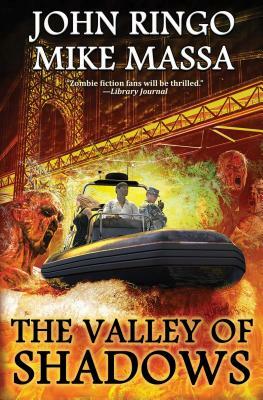 There are an additional seven collaborations from the Posleen series: The Hero, written with Michael Z. Williamson, Watch on the Rhine, Yellow Eyes and The Tuloriad, all written with Tom Kratman, and the New York Times best seller Cally’s War and its sequels Sister Time and Honor of the Clan, all with Julie Cochrane. His science-based zombie apocalypse Black Tide Rising series includes Under a Graveyard Sky, To Sail a Darkling Sea, Islands of Rage and Hope and Strands of Sorrow. A veteran of the 82nd Airborne, Ringo brings first-hand knowledge of military operations to his fiction. Mike Massa has lived a diverse and adventurous life, including stints as Navy SEAL officer, an international investment banker and an Internet technologist. He counts his greatest adventures as marriage and parenthood. Mike is currently a university cyber security researcher, consulted by governments, Fortune 500 companies and high net worth families on issues of privacy, resilience and disaster recovery. He lived outside the U.S. for several years (plus military deployments!) and has traveled to over eighty countries. Mike is pleased to call Virginia home, where he passionately follows the ongoing commercial space race, looks forward to family holidays, and enjoys reading the latest new books by his favorite SF&F authors.